Gretl and Rose Red have a lot of ARCs to get read so they're signing up to participate in Read. Sleep. 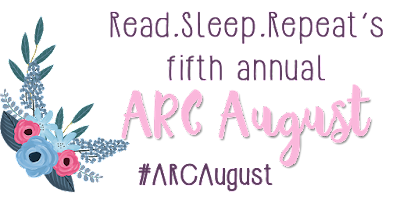 Repeat's 5th Annual ARC August Challenge! Remember, ARC August has always been about having fun first and finishing ARCs second. Remember this as you tackle your piles, and use the tag to keep each other motivated. Unlike most years, this ARC August I’ll be sitting on the sidelines for the most part. I haven’t requested or received an ARC in ages! But this just means I’ll have more time this year to focus on YOU! So be prepared for lots of caps in your timelines and an unrelenting amount of cheering. What ARC should we read first? 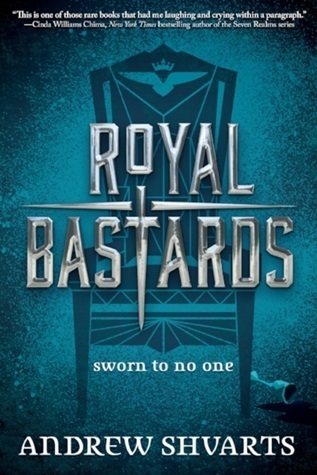 Everyone here knows that I'm an avid Ilona Andrews fangirl and that any novel they write is on my auto-buy list, so it shouldn't be a surprise that I absolutely adored this book! Wildfire starts off a few hours after the conclusion of White Hot and it was a ride from that point on. My advice for when you start this book is to not start it until you have enough time to read it in one go. I started it before bed one night thinking I'd read a bit and then finish it the next day. That's not what happened. I just kept reading until I finished the book at 4am. I should know better than to start an Ilona Andrews book before bed by now. I know I said it in my review of White Hot but I completely adore the Baylor family! I love their dynamic together and that each member is so different from the others except for the deep love they feel for each other. Both of those things lead to some hilarious and tender moments in the book. I loved finding out more about Leo, Catalina, and Arabella's magic. Honestly, I did not see Arabella's brand of magic coming but it added so much to the story! I also adore how big the Baylor's hearts are. Matilda and Cornelius have kind of been integrated into the family along with Rogan and it was everything! Also, can I say I want to find someone who loves me as much as Grandma Frida loves Romeo? Nevada has come a long way since the start of the series. She was always self-assured and very self-aware with a deep devotion to her family but in this book, she is more open and accepting of letting others into her tight circle, especially of Rogan and the feelings she's developed for him. She’s used to being the one taking care of problems for her family but not so used to someone helping her take care of her problems. The fact that she doesn’t keep fighting it, while working to maintain her own need for hard-won independence, was a very nice development. The same can be said for Rogan. He isn’t used to anyone restraining him or putting restrictions on how far he is allowed to go for his goals. Nevada makes him a little more human, which means a little more vulnerable. He's never resentful for that. In fact, he seems to be mostly grateful that she doesn't let him toe the line. He's adapting and trying to bridge the gap between his possessiveness and Nevada’s needs to make their relationship work. Like Nevada, he isn’t used to anyone taking care of him, so Nevada’s care is new, surprising, and very much welcome. 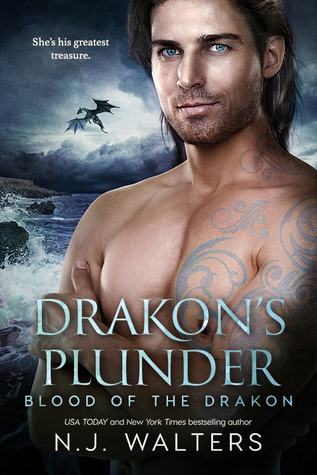 What I loved most about this book is that it had so many opportunities for there to be angsty drama between Nevada and Rogan, but every time it went in the complete opposite direction of the angst. There was communication and trust between them and it was so refreshing to read! A lot of authors feel like they have to keep the pot of misery stirred to make magic happen. Nevada and Rogan are constantly in situations filled with mortal danger, why would they need more issues? The relationship between them really pushed the book forward and made me believe in them more. I love them together so much! Wildfire is supposed to be the third and last book in the Hidden Legacy trilogy, but the authors have mentioned that they plan to write at least one more book with Nevada and Rogan and maybe more in the universe. And that is very much how the novel reads. Plot lines that need to be wrapped up to satisfy the reader are wrapped up, but some larger plot lines are left open. COME ON, AVON! GET ON THAT! I NEED MORE BOOKS IN THIS SERIES! Thankfully, the authors announced on their blog that if the next book isn't picked up by the publisher that they'd self-publish it which is wonderful news! Because I need at least one more Nevada and Rogan book! I would like to note here that I also want a book about Catalina and a certain Italian mage. And an Arabella book! And a Bern book! And a Leo book! And hell, I want a Matilda when she's older book. 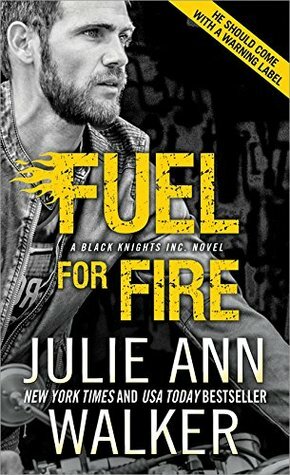 And before I can start listing books for each member of Rogan's team, let's just say I need more books set in this universe period. ARC was provided by the publisher via Edelweiss. 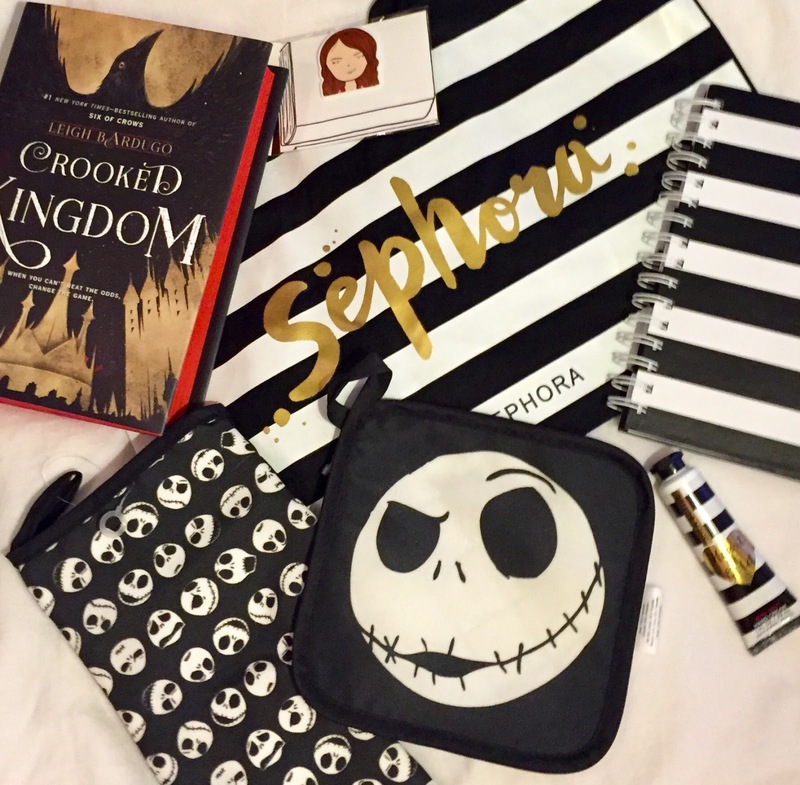 To enter our final blogoversary giveaway, you must be following us on Instagram (Link at the top of the sidebar.) and participate in our Blogoversary Bookstagram Challenge. It starts Monday July 31. Make sure you use #sixofweres and have your account set to public so we can see your posts. Monday 7/31- #sixofweres We're celebrating six years so show us your favorite (hopefully bookish) group of six, like the Dregs from Six of Crows. Tuesday 8/1- It's #girlfriendsday! Who's your favorite heroine? We totally want to be friends with her! Thursday 8/3- It's International #clownweek! What book made you laugh? Friday 8/4- It's #internationalbeerday. Show us a book and a beverage. Saturday 8/5- It's National #underwearday! What's your favorite steamy read or the book with your favorite steamy scene? Sunday 8/6- It's #friendshipday. Who are your favorite BFFs in a book? This black, white and gold prize pack will go to one participant in the challenge. It includes a signed copy of Crooked Kingdom, Six of Crows inspired bookmark from Jane's Tiny Things, Jack Skellington oven mitt and pot holder, a striped tote bag and notepad, and a hand lotion from Bath and Body Works. International entries welcome. Winner chosen on Tuesday August 8. 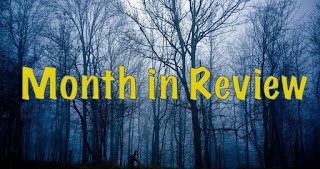 Did you miss any of our blogoversary giveaways? They're still open! The best thing we did in July was celebrate our 6th Blogoversary. All of our giveaways are still open so check them out. And there's one more week of celebration! Our Blogoversary Bookstagram Challenge starts Monday. More details in Monday's post and on our Instagram. But we did also review some books and do some normal blog things. And we introduced a new feature with book recs inspired by TV shows called Watched That? Now Read This! Check out our Supernatural list. Can you believe it? We're turning six this month! And we're celebrating with six awesome giveaways! 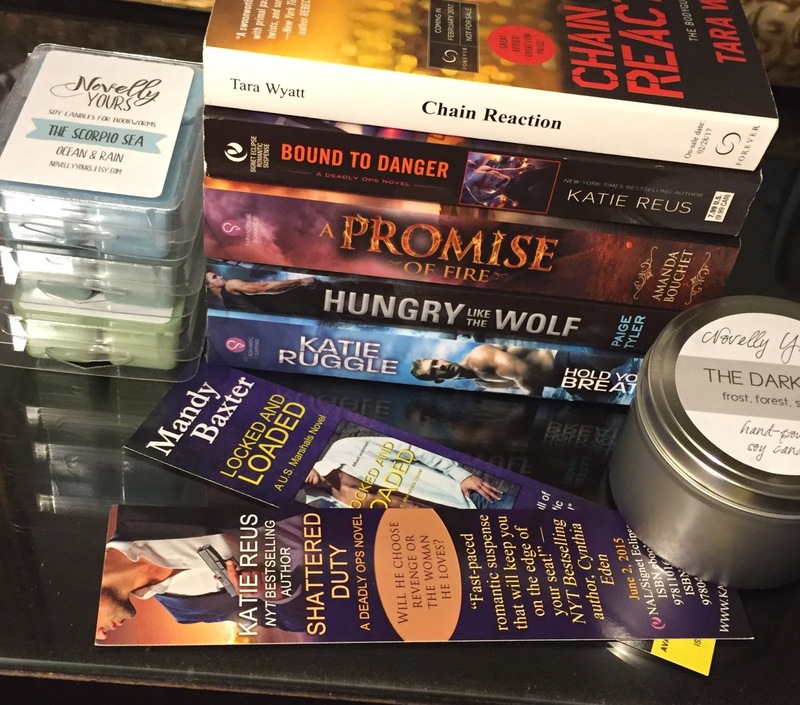 Today's book bundle includes 5 YA SFF titles plus a Sarah J Maas-inspired candle and bookmarks. 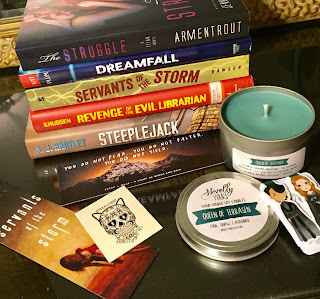 Did you miss any of our Blogoversary giveaways? Today's book bundle features 5 romances, including paranormal, fantasy and suspense, plus a candle and wax melts from Novelly Yours and bookmarks. I think I mentioned this in a previous T5W post, but this series is one that took a while to get going. 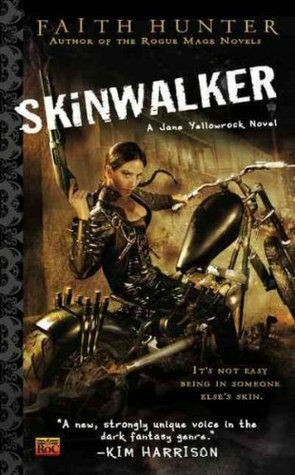 The writing is really dense in the first few books and Jane is judgemental and self-righteous. 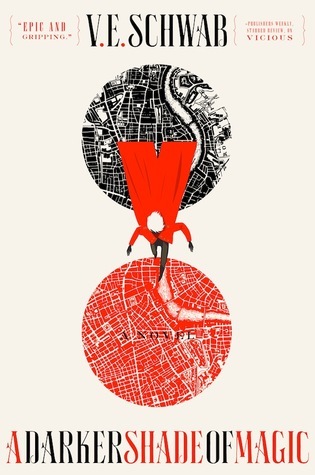 But afte nine books and a spin-off series, this is one of my favorite worlds. It's so worth it to slog through the beginning. This might be an unpopular opinion since I know a lot of people really loved the first book. Rose Red and I both had mixed feelings about it. We loved the world but hated the over the top alphahole behavior. But I think I'm hooked now. 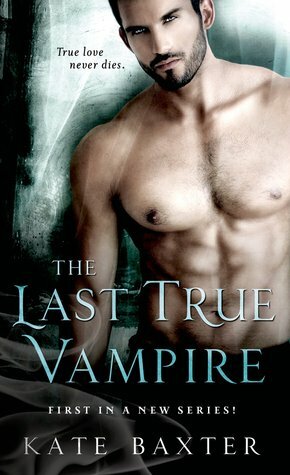 Book four adds werewolves into the mix and the supernatural politics are more prominent. 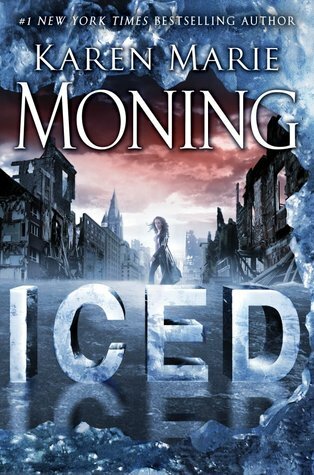 The first book in this trilogy was amazing but it did a lot of worldbuilding for the whole series. That worldbuilding, while wonderful, slowed the pace down for most of that book. 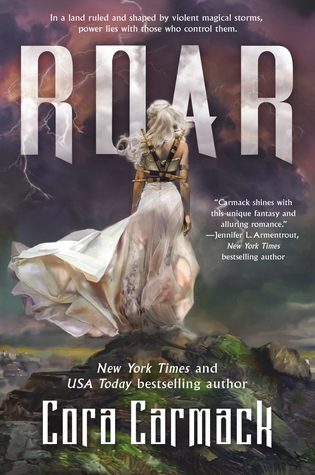 Books two and three are where this series hit its stride because they could focus on events and characters instead of the world and magic system. That being said, our Rose Red still gave each book five stars. I realize it's strange to say this series improves when we gave book one a five star review, but it does. There's a lot of weirdness between Nevada and Rogan at first, but when they finally get together in book two it's so much better. 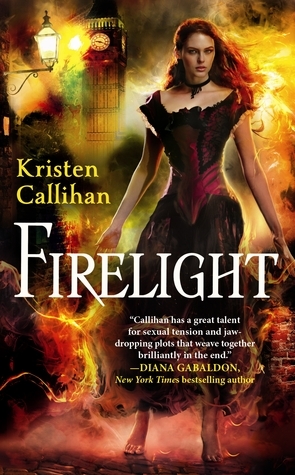 I didn't hate the Firelight, the first book in the series, but I was expecting Steampunk elements that it didn't really deliver. And we don't actually find out what Archer is until a later book, which makes his story so much better. What are your favorite series that just got better as they went?